2020 Ski Lease, reserve now. Jan - April. At this time, no instant bookings January - April. Reserved for SKI LEASE only. If interested you'll have to contact me for a quote. This system will not give you an accurate quote for a ski lease. Great cozy cabin to enjoy the feel of the mountains of Tahoe! Forest all around you with snow sledding just up the road a mile at the multi million dollar Trout Creek Rec. Center. They have a full on gym, 2 heated pools, 3 hot tubs, steam rooms and sauna's with a changing facility including lockers and showers. Our own beginner ski resort is just up the road 2 miles, great for families and beginners and you can rent all your equipment right there for a very good rate. You can take a hike right out our front door for miles of nature and forest. Beautiful and so peaceful. You may even see some wildlife! Our resort also has spectacular dining whether you want white table cloth or casual. We have both. The lodge is quite the place for a happy hour glass of wine, beer or cocktails with some appetizers. Casual - Pizza On The Hill has many things besides pizza and very good. Great with young kids. The golf pro shop is next door to the Lodge. Our cabin is modern rustic with antique wall décor like skis, snowshoes, fishing gear, and mountain art. It is light and bright and open, with lots of windows, and a sunny, private location WITHOUT the traffic noise. Very quiet and private yet only about a mile from town and Donner Lake with our resort's private beach. The amenities are very close too. Old town Truckee is about 2 miles and it's a must see with the wood sidewalks, restaurants and shops of the old time west. Bar of America is a must for a great meal, wine and suds. The kitchen is covered in knotty pine and black stone counter tops, looks like old style Tahoe but with a modern flair. The kitchen is well stocked with a coffee maker, dishes, flatware, pots/pans etc. Fridge, dishwasher, stove/oven, toaster oven, microwave, COFFEE maker, blender and Crock Pot. A high efficiency washer & dryer too. For dining we have a large, 10' long log table that can seat 12 adults plus two stools at the kitchen counter. The great room has three couches in front of a beautiful rock hearth and fireplace to enjoy on a winter night. The fireplace is gas and all you do is flick the switch and voila, you have a fire! 2 TVs with DVD, 1 in the great room and another in a bedroom upstairs. Also a CD/radio stereo in the great room. Wifi runs throughout the house. Large rear deck with chairs for the summertime to read a book or doze off in the fresh air among the trees of the forest and hear a breeze flowing through the trees. Our house is located in the Tahoe Donner Resort which has many amenities that as our guests, you are entitled to enjoy. They charge $12/per person, 7 YOA and older/per day (under 7 YOA is free) for the use of the recreation centers with 3 pools (1 heated all year), 3 hot tubs, 2 steam rooms, 2 sauna's and a professional exercise gym with classes, ping pong table and the private beach with dock and boat launch on Donner Lake where you can lay in the sun on the lounges provided, swim, play in the sand, rent a boat or kayak and visit the snack bar. BBQ your lunch or dinner there in their BBQ pit's and picnic tables. The fee covers you for the whole day at several amenities so keep your receipt. We also have our own private golf course, tennis courts, horseback riding , campground, ski resort and sledding at the Lodge during the winter. Please check it all out!! There is just so much to do. A great location with ton's of activities. You can't get bored here! A nicely decorated cabin with a modern yet rustic mountain theme and rustic decor. We have wireless wifi throughout the house. Pets are allowed at the cabin but NOT ON ANY FURNITURE, ie: beds, couches, etc. Floor only. If this is not acceptable to you then please find another cabin. There is a pet bed on the floor there for your pets use and a cable to keep them on the bed if you like. The pet fee is 25/night/pet. We require insurance with all reservations and higher levels of coverage depending on how many pets you have. Gently sloped yard great for sledding during the winter and playing in the summer. * NOTE * We offer linens (sheets and towels) as optional so those on a tight budget can save money. Most people driving in bring their own linens and save some money but it is your choice. Just let us know what you would like to do. Our linens are 15/person, for both sheets and towels or 10/person for sheets only, or towels only. Blankets and pillows are provided. Scroll to the very bottom of this page for additional rate and fee's info. Feel free to contact me daily between 8 am - 7 pm, daily, pacific time. We've owned and operated this vacation house since 2002. My wife and I are semi retired and live in the San Francisco East Bay, Lafayette and love vacationing in beautiful North Shore Tahoe. We love the outdoors with skiing and sledding in the winter and biking, boating and hiking in the summer. We both grew up in the bay area and have been coming to North Shore Tahoe for most of our lives. We love it and we're sure you will too! We chose Tahoe Donner due to the beauty of the development (always looks clean and well maintained) easy access to everything ie, skiing, lake, fishing and golf AND the plentiful Tahoe Donner's own amenities. There are just so many activities around our resort and the whole north shore area. Only about a mile to Hwy 80 and Reno is about a 35 min. drive. SF Bay area is about a 2.5 to 3 hour drive, depending. So many amenities. Summer and winter offer spectacular activities. It is so great to relax out on the deck and enjoy the sun streaming in through the tall pine trees. An occasional breeze blowing through the trees high above makes a great mountain sound. Hiking right out our front door and the multi million dollar Trout Creek Recreation Center with all the amenities there. 2 full Bathrooms, one on the ground floor attached to the master bedroom and another upstairs between the two bedrooms, aka Jack & Jill set up. Lots of amenities in our resort. Forest and tall trees all around you. To keep our rates down and help you save a little money, linens like towels and sheets are optional. They are 15/person, or sheets only or towels only are 10/person. You decide whats best for you. Room for about 5 cars in the driveway. Beautiful facility at the recently renovated Trout Creek Rec Center. Open space great room with couches and dining area. Miscellaneous items like many spices are available. Big 10 foot long log table can seat 12. 2 TV's and a stereo with CD. 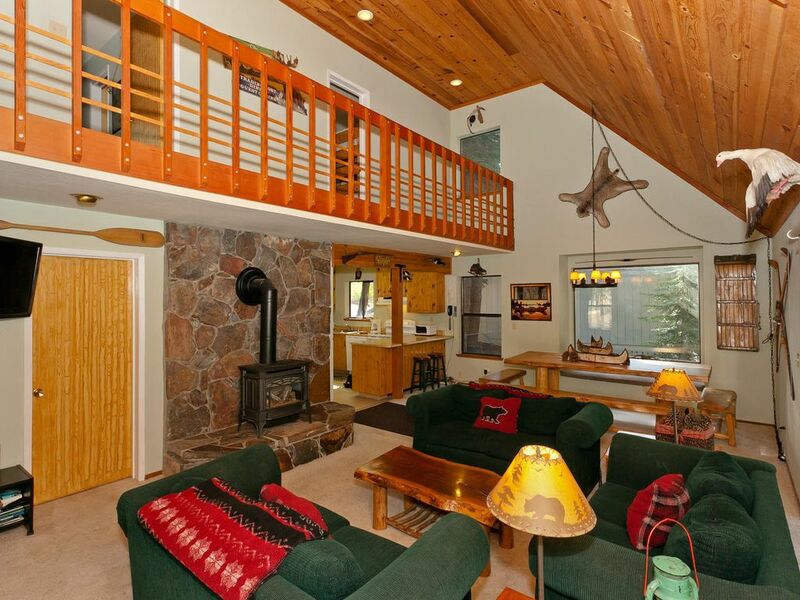 This home is located at Tahoe Donner Resort, as my guests, you are entitled to use the amenities. They charge $12/per adult all day use of the recreation centers with 3 pools (1 heated all year), hot tubs, steam rooms, gym and ping pong table. We also have a private beach with lounge chairs, dock and boat launch on Donner Lake where you can swim, play in the sand, rent a boat and visit the snack bar or BBQ your lunch or dinner there at the BBQ pit's during the summer. Excellent golf course, tennis courts, horseback riding, a campground and small ski resort plus sledding at the Lodge. Once you pay you are covered for several amenities all day long. Check them all out. There is a fully equipped kitchen for your cooking needs. Fridge, dishwasher, stove/oven, toaster oven, microwave, COFFEE MAKER, blender, large crockpot, as well as a full size front load washer and dryer. Great location tucked away from the business. Easy to get to skiing, Donner, Lake Tahoe, and the summit for hiking. Suggestion: Offer "glass" drinking cups along with the plastic tumblers. Thanks for sharing the house! Tor, thank you for sharing your cozy cabin. We had a wonderful, relaxing time with our extended family. I like your updates to the cabin. The new floors and updated bathrooms look great. We cooked most nights and appreciated the extra spices and loads of cooking tools. Beware! High deposit or insurance policy required. Snow not shoveled and owner charges ridiculous fees for arriving before checkin or late checkout. Very inflexible charging per minute early or late with digital lock box. When asked for late checkout because we had to shovel our own snow, he asked for photos of before and after of our work. Ridiculous and will never rent from him again. Warned! This traveler is what is known to hosts like me as the traveler from hell. What a nightmare she was! Still, I'm sorry she had a bad experience. for my own property. She continued to try and intimidate me. I even went as far as compromising my security requirements for her but her arrogance still reigned. After bending over backwards for her, she was still nasty, pompous and arrogant. There was no making her happy. Hence the poor review with lies. I expected no less from this woman of wealth with an attitude to go with. Look at my numerous great reviews and decide for yourself. She has a traveler rating of 2 out of 5, while mine is 5 out of 5. If you have a question regarding this or any other issues, please ask me, I will respond. I have been a host for 17 years and I always try hard to please all my travelers all the time. Very clean place, it have everything we need to relax . Nice quiet neighborhood. Well located . Definitely a Cabin that I will recommend and looking forward to go back again. Great location. Owner very helpful and quick to respond. Place really clean and great for a family get away. Glad you and your two families enjoyed our cabin. Until next time. World, USA, California, Lake Tahoe area, Truckee, North Tahoe area, Tahoe Donner. Other Activities: Kayaking, cross country skiing, snowmobiling, rock climbing, basketball, shopping, boating, snowboarding, wildlife viewing. Golf: My home is within 5 minutes to three top rated golf courses in Truckee. Considered some of the best golf courses in Tahoe. Ski: Snow skiing is just 5-20 minutes away. The 4 best in all Tahoe are Squaw Valley, Alpine Meadows, North Star and Sugar Bowl. We have quick access to all 4. Or we have our own small private resort just up the street, five minutes away, perfect for beginners and great rates. Several children's snow parks around as well and one right up the street. Summer mountain biking at nearby ski resorts is awesome.